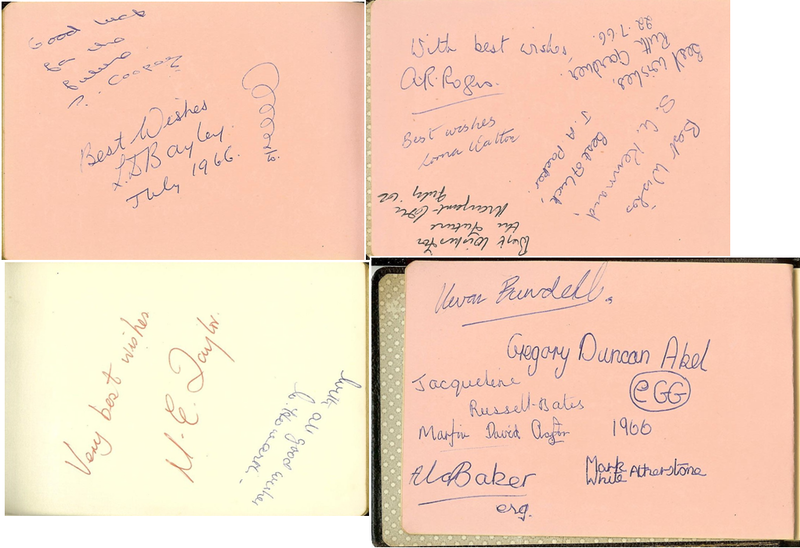 Children’s games – Eeny meeny/Macka racka; Flick cards; Royton, Lancs, 1950s. Why is Rupert Bear so popular ? Prices School Fareham ‘Folk’ Concerts – 1969-75. Richard Phillimore (1907 – 2004). Birds, wildlife, places . . .
A few of us made it to the Fair [i.e. 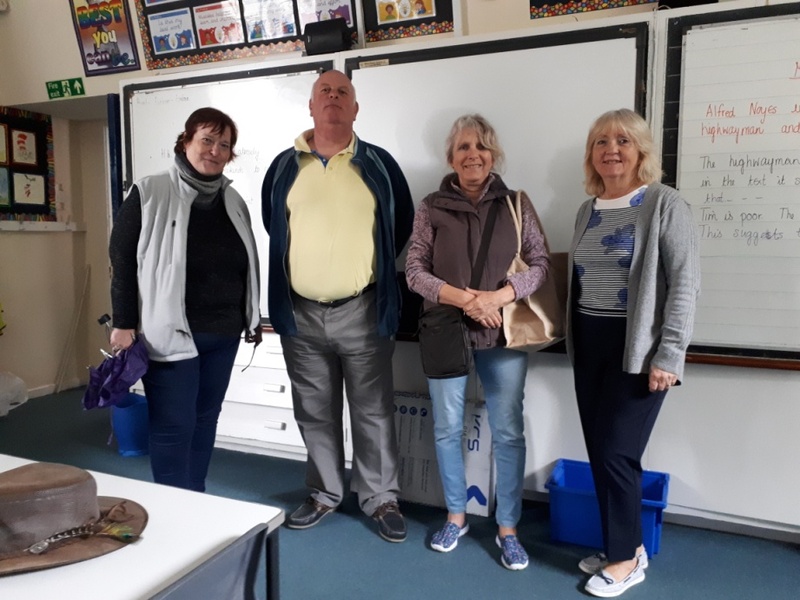 the Eastwick May fair 2018] and despite it raining from the moment we arrived it was an interesting visit. We managed to have a look around inside and spent some time remembering classes and teachers. We were pleased to see that the House names remain the same – although sadly the brick wall along the side of the field has gone and the playground has been built on – but I don’t expect they are allowed to play Kiss Chase now anyway! Sorry I missed it, unavoidable, but see you next time. Very sad that ‘The Wall’ has gone. 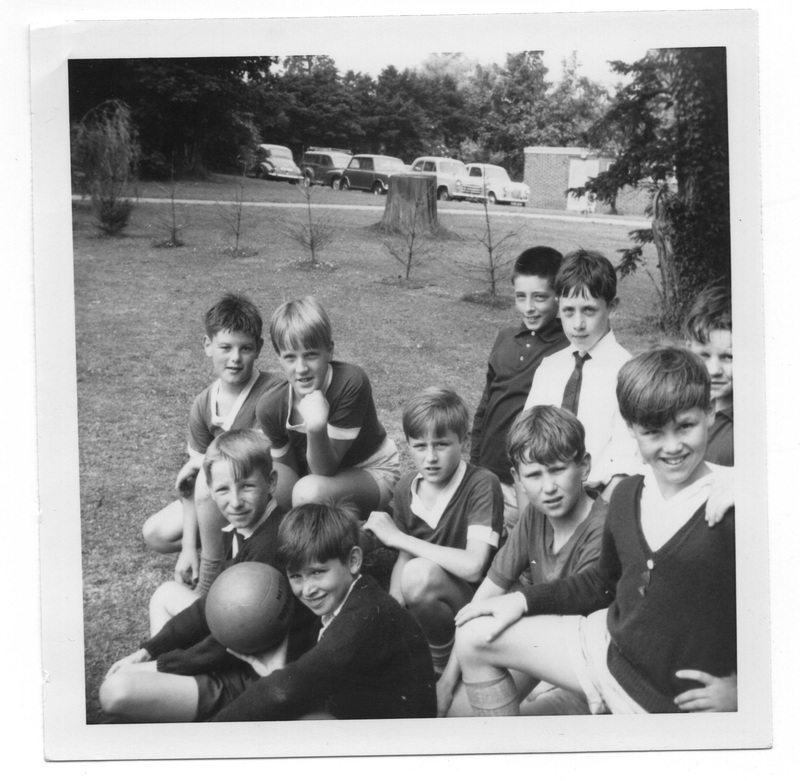 (Speaking of which, who knew that Roger Waters of Pink Floyd was born in Great Bookham – a bit before our time, in 1943?). Wikipedia says “Eastwick Park, a beautiful manor in the village, was lost in 1958. The house stood within the area of roads now known as the ‘Eastwick area’, and its very large private estate included Great Bookham Commons, which were saved by the village and given to the National Trust. 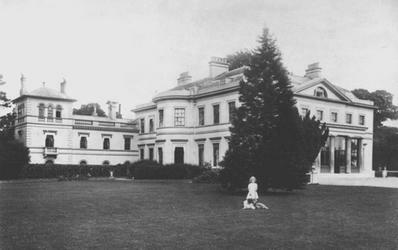 Since being used as a private house, the manor was used by Canadian military in the second world war, and was also a school called Southey Hall, before being demolished for redevelopment. The original gates to the house stand just west of Eastwick Park Avenue on Lower Road.” I recall my dad saying how the Canadian army used the school as a training ground and how they trashed the house so badly it had to be demolished. In our time I remember a couple of boys found live-round bullets and a few years earlier someone found a live hand-grenade. Who remembers the black timber shed on the way to the old farmer’s place? Apart from the wall, I think all that remains of the original park estate is the brick stable block (used to be our sports changing rooms, horrid and cold) and any exotic trees that still survive. “Tanglewood” , Outlands Lane, Curdridge, Southampton SO30 2HD . With the music of : Ivor & Kevan Bundell, Paul Gateshill, Shamini Bundell, Nick Kahn, Nick Manley, Mick Daysh, Chris Nash, Neil Pritchard, Cheryl Craven, and ? and a tent if you’d like to stay over and then enjoy a lazy Sunday morning eating breakfast and clearing up ! A 1966 class reunion was held on the 16th September 2017 at the Windsor Castle pub in Little Bookham. Joy Spencer/Taylor, Linda Davies/Scrase, Martin Claytor, Bob Medland, Chris Scriven, Ian White and Kevan Bundell attended. Jessica Perkins couldn’t make it, but sent her greetings. Miss Bayley, and others, were fondly remembered. Photos were perused and people identified (see below). The contents of Kevan’s and Bob’s News Books were amusingly shared. We all had a jolly good time. 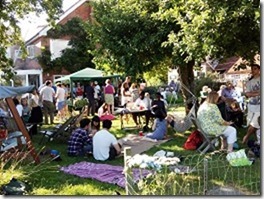 We vowed to gather again at the next Eastwick School Fête/Fair in 2018. We also agreed to track down other classmates and invite them to join us there. If you are one of them, do send me an e-mail. We would all love to see you again. 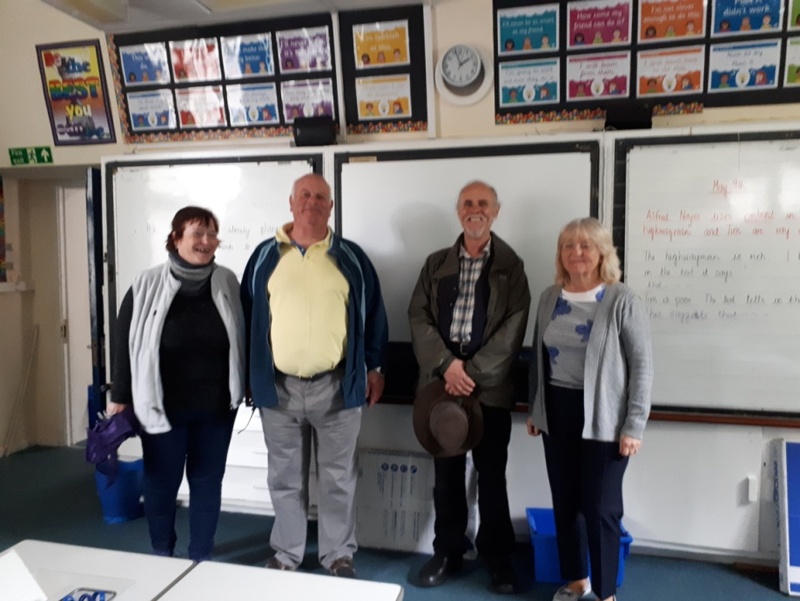 Many thanks to the BRA for hosting this material, and to Ali Kelman who collected it in the first place and arranged for it to be transferred when the School web site no longer had a space for it. If you have any photos or other material from Eastwick in the 1960s I would be happy to receive copies and post them here. 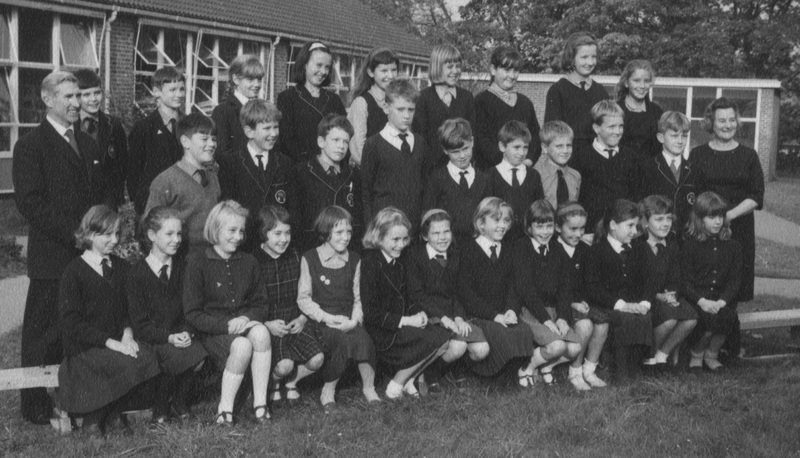 I would especially like to see any photos you may have from the photo project that was conducted in the first half of 1966 ( I think) by Mrs Jean Harrowell, a part time teacher, as I recall, possibly incorrectly. The first seven photos below are from that project. Any comments you may have (as well as photos!) would be very welcome. Football Team 1965 – b. -Christopher Glaum, Robert Muirhead, ? f. – Ian Cook , Alan Baker. 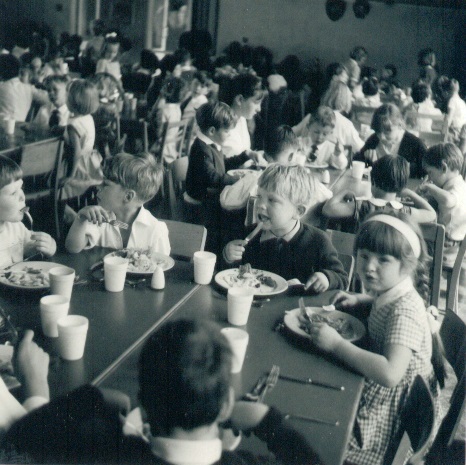 School dinner – featuring Nicky Carter (with the fork) and Avril Bundell (with the Alice Band), both aged 5. Yvonne Tomlins and Hazel Smoulders are in charge of the table behind. Bill Sheldon, Ian Beasley, Johnnie Aldous, David Jones. Class Play – Clare Milne, ? , Tony Stanton, unidentified legs . . .
Tony’s family moved to Australia in the late 60s. The persons that bought their house told me (in ’73) that they had heard that Tony may have died in an accident. I can believe it. He was a dare-devil. Nonetheless, I would happy to hear from anyone that it wasn’t true. Click on this photo to make it bigger and then tell me who you/they are ! m. ? Joy Spencer, Ian White, Phillip Barnes, Julia Heath, Hazel Smulders, Diana Baxter, Elizabeth Dalgairns, Michael Baker, Christopher Scriven, Robert Muirhead, Rona Stockwell. f. Linda Bannister, Marion Taylor, Amanda Webber, Roger Doswell, Robbie Medland, ? , ? , ? , ? , Jonathan Stevens. Note that Elizabeth has seen something shocking going on behind the photographer. Diana has noticed it too and shut her eyes – quite properly. Jessica, meanwhile, has seen it and is still looking ! b. – Mr Taylor, Robbie Medland, Roger Doswell, Hazel Smulders, Joanna Woods, Elizabeth Dalgairns, Avril Derbyshire, Yvonne Tomlins, Diana Baxter, Jennifer Mountain. f. – Julie Dowden, Julia Heath, Jessica Perkins, Julia Gardner, Mary Samms, Joy Spencer, Hilary Capeling, Linda Davies, Jackie Russell-Bates, Mary Sturgeon, Lynne Parkinson, Suzanne Weston, Caroline Taylor. 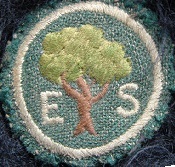 Miss Bayley joined the staff of Eastwick Primary School, I calculate, sometime in 1963/4. I remember her arrival. Suddenly things began to change in our morning school assembly. There were new ideas, new components, creative changes. She taught my older brother Arnold in his last year at Eastwick in ‘63/4. She became my class teacher in September ’64, and remained so for two years until we left in July 1966. She had a one-eyed Song Thrush in her garden called Nelson. She introduced a maths-teaching tool called Colour Factor which was very modern but which I totally failed to comprehend. It was the time of the Tokyo Olympics. She set maths questions on the board and a race to answer them, awarding Gold, Silver and Bronze stars to the winners . . . I remained starless. 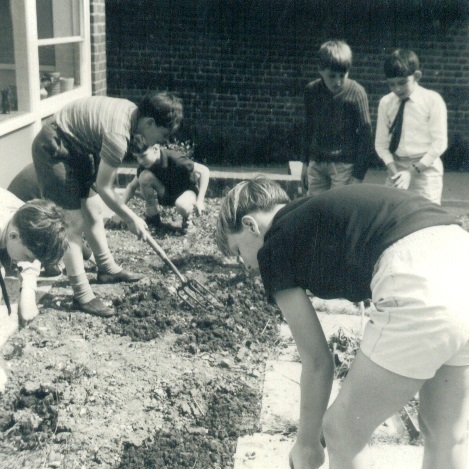 However, she also got us boys gardening (photo above – the girls were busy dressmaking I think) – and she put up a bird table outside the classroom window. This was pioneering stuff. At this time feeding the birds mostly meant throwing crusts of bread out in the back garden or hanging up bacon-rind. She bought proper bird feed. She put up large RSPB bird identification charts on the classroom wall and Robbie Medland and I competed to identify each bird (Robbie always won). We thereby came to know birds which we had never actually seen – and many which I have still not seen. Miss Bayley also encouraged my artistic leanings – drawing and painting animals and birds. She even set me up with a one-boy show of my work on the corridor wall. She paid for me to join the RSPB, and continued to pay my subscription for some years after I had left Eastwick and moved away. We corresponded during that time, until I grew into a teenager and probably just stopped writing any more. I did meet her once during those few years, at an Eastwick School fete in, I would guess, 1968. By this time I had been growing for a couple more years. I towered above her. As the photo above shows, she was really very short, only I hadn’t noticed when I was short too. Now I was an awkward thirteen year old. I don’t know what I said to her. I hope I thanked her for being so very good to me. 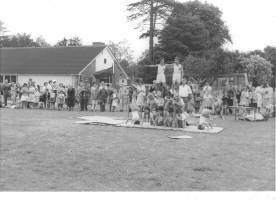 I don’t know who any of the 1960 Tumbling Team above are, I only remember that from the time I joined Eastwick (in 1960) I watched each year’s team perform at the school’s Summer Fete and yearned to be part of their fantastic gymnastics. What I loved most was their quick-fire sliding across dining tables in alternate directions routine. Mr Taylor was the coach. The team members were selected from the top class only. 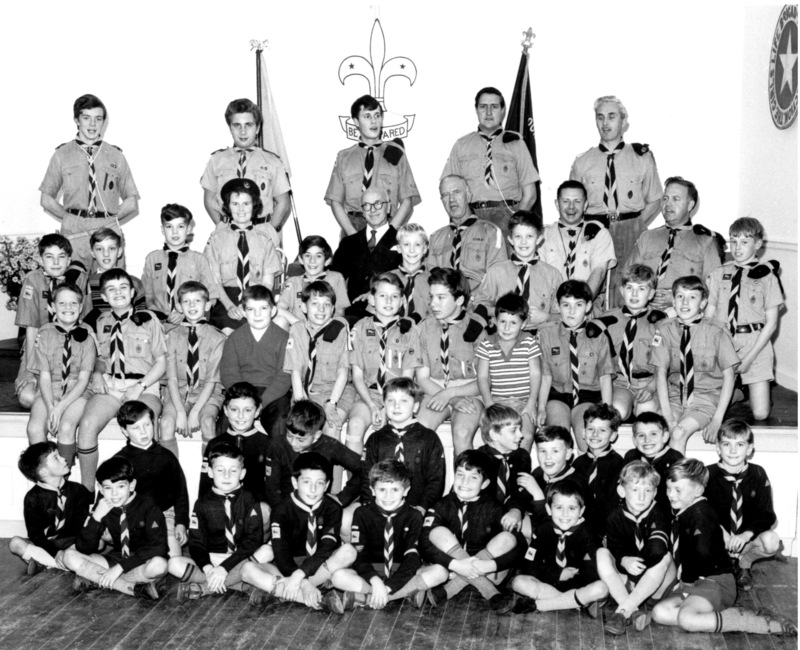 I finally reached the top class – in September 1965. Mr Taylor asked for volunteers. I volunteered. We had our first session in the school hall. Tragically, that first session turned out also to be our last. I was (still am !) devastated. 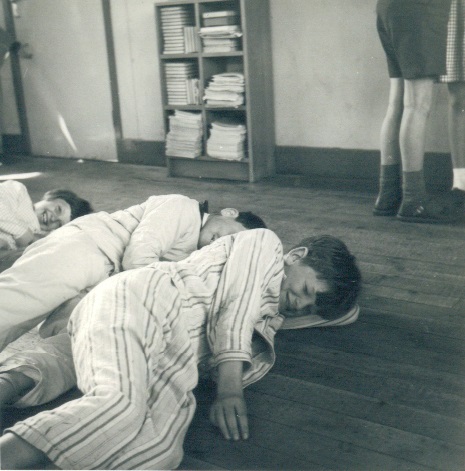 Perhaps Mr Taylor was by then too busy being Headmaster to find the time for training a Tumbling Team. (I also recall that, by then, he no longer entertained us with the occasional Brer Rabbit story in morning Assembly). Who knows ? 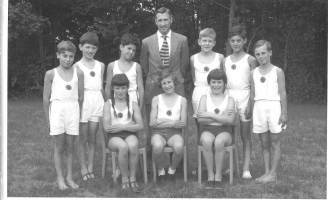 I could probably have been an Olympic gymnast if only there had been an Eastwick Tumbling Team in 1965/6. Daily Mail (June’65) : Jackie Russel-Bates, Linda Davies, ? , ? , Paul Hiscutt ? , Michael Baker, Martin Claytor, Diana Baxter ? , Laurence Robinson. Row 1 (top) : ? , Harold Franklin, ? , ‘Akela’ Mr Fournier, ‘Chip’ Bob Mills. Row 2 : 4. ‘Bagera’ Mrs Bellet, 6. Mr Bellet ? , 8. GSM Mr Tarrington (‘Tarry’) , 9. Mr Keeble, 10. ‘Skip’ Jim Bundell, 11. David Stockwell ? Row 3 : 3. Geoffrey Weiss ? Thanks to Graham Smith for sending me this photo. Please name more names ! Please read the pages under ‘Children’s Games’, and then – if anything comes to mind – please add to and/or comment on the list below via the ‘Leave a comment’ option at the end. Thanks. Chasing games : Terms used for chaser – he or it (different terms are used in different parts of the country). You could also quickly say Baggsy not it ! Ball he – i.e. throwing a ball to ‘catch’ the chased. – Was there a term and/or a gesture for stepping out of the game for a while so that you couldn’t be caught (e.g. while doing your shoe laces up) ? – Was there a safe place where you could not be caught ? – Could those who had been caught be released ? O U T spells OUT ! – Counting out is often called dipping. Did we use that term ? Or some other ? French skipping : like cats cradle, but with a long piece of elastic stretched between the ankles (then knees) of two players standing opposite each other a few feet apart. A third player has to jump over, catching the elastic with their feet, a number of times until the elastic is woven into a set pattern. Then they have to undo it by repeating their previous moves in reverse. Get your knives and your forks and CUT IT ! Piggy-back fights : a boys game only I think. Playing horses : two children grasp each others hands behind their backs and prance around pretending to be a pair of horses.
. . . . . . ? Mrs Rogers was my class teacher for two years, 1961/62 and 1962/63, my second and third years at Eastwick school. I remember her with great affection. I met her again when she was a hundred years old and had just received a telegram from the Queen. She was delighted to read my News Book – a daily diary – from my years in her class and to see her red ink corrections of my atrocious spellings. My mother, Amy Rosa Rogers (nee Laskey) was the eldest of four sisters, and was born in Twyford, Berkshire on 27th September 1899. She died in Dorset on 5th July 2002. Thus her life spanned 2 millenia, 3 Centuries and 6 Monarchs. She and her parents moved to Canterbury in Kent soon after she was born, where her father established a market garden. In March 1912 her mother died of TB, and consequently she acted as ‘mother’ to her three younger sisters, and also ran the kitchen in the household. In the following year, 1913, the second eldest also succumbed to TB leaving her to look after the two youngest sisters. By the time The Great War started she was already half way through her Secondary schooling. She excelled at school, was very musical and developed into an accomplished pianist. She became Head Girl and stayed on during the last year of the War when staff were scarce, and took some of the singing classes. She left school in the autumn of 1918, and went to Goldsmiths College London, and particularly remembered the celebrations of the Armistice in the November that year. After four years at University, she started her teaching career in Kent in 1922, and two years later her father died, again of TB. In June 1928 she married Victor Rogers, and in the autumn moved to Oxted in Surrey where they set up home. In early 1929 her youngest sister died of TB, and in 1930 her eldest son Michael was born. They then moved to Leatherhead in Surrey where in 1933 her younger son Peter was born. In 1937 she returned to teaching to do some supply work at the local Secondary school, and became accompanist for Leatherhead Choral Society. 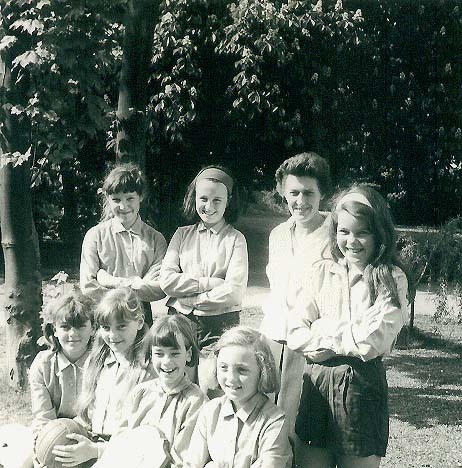 When War broke out in September 1939, she returned to full time teaching at All Saints Primary school in Leatherhead. 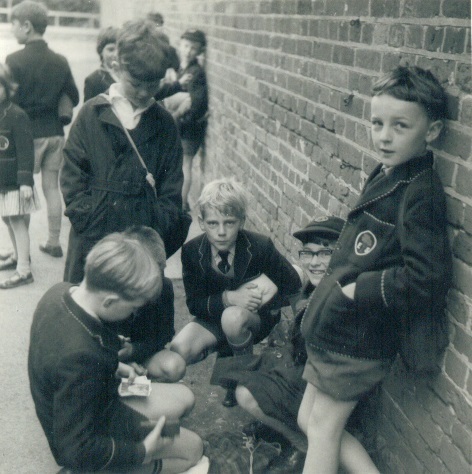 The school population increased dramatically as evacuee children from London were billeted in the area. 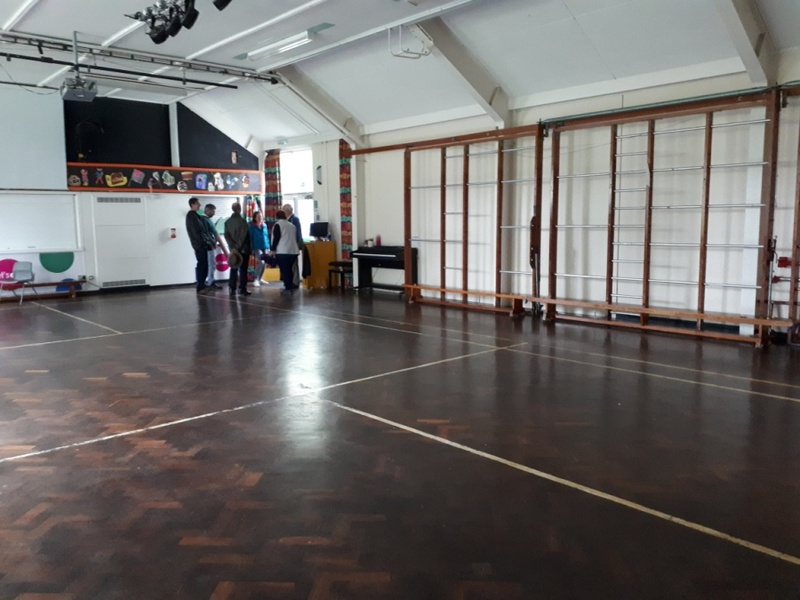 All Saints Hall adjacent to the school was used as an overspill, and she and one other teacher, each had a class of sixty children in the Hall – the classes were just divided by a curtain! 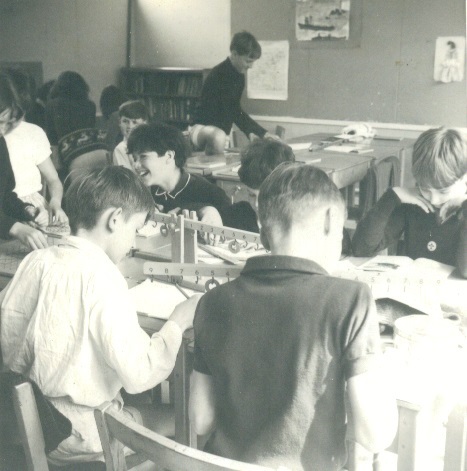 After the War ended, she reverted to part time teaching, and the family moved to Great Bookham in 1947. Just before Christmas 1947 her remaining sister died of TB, so she was her families’ sole survivor of this scourge. Apart from part time work, she led a full life within the community in these immediate Post War years, and continued to play for the Leatherhead Choral Society although she now lived in Bookham. 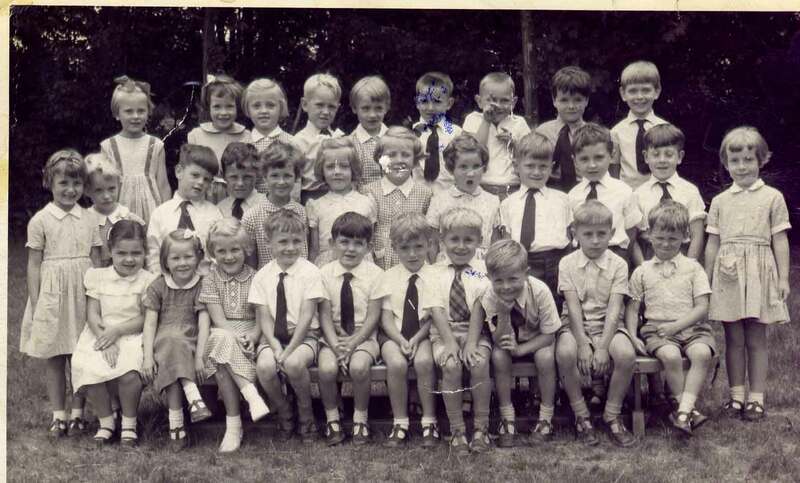 She learnt to drive and had her own car, and after her husband died in 1960 she returned to full time teaching at Eastwick Primary school in the village, and continued there until July 1969, just 2 months before her 70th Birthday. At this stage, it was no surprise that Surrey County Education Committee confirmed that she was the oldest teacher on their books! By this time she had six grandchildren, and loved to see them and hear about their latest exploits. Then in 1976, she moved for the last time, and “retired” to a bungalow Verwood in Dorset. She again led a very active life for many years, taking up both pottery and painting again, and playing the piano accompanying two string players. In 1999 she celebrated her 100th Birthday with the family, which by then included two great grandchildren, and she was very proud to show everyone her birthday card from the Queen! She continued to enjoy a very full life in her bungalow for a further 2 years and only went into care for the last 6 months of her very full life. 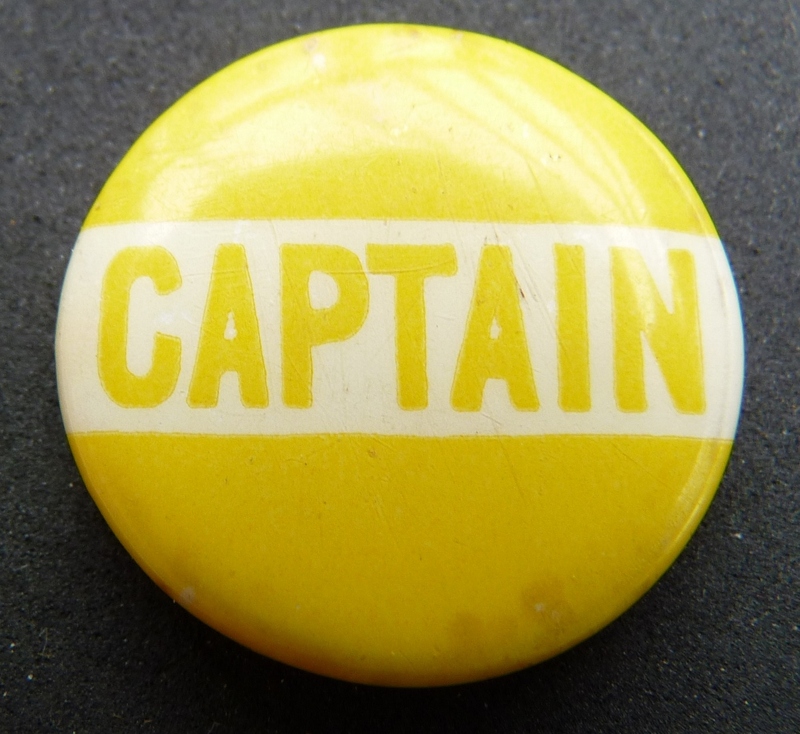 Nick Manley on Alan Glynne-Howell – an appreciation. 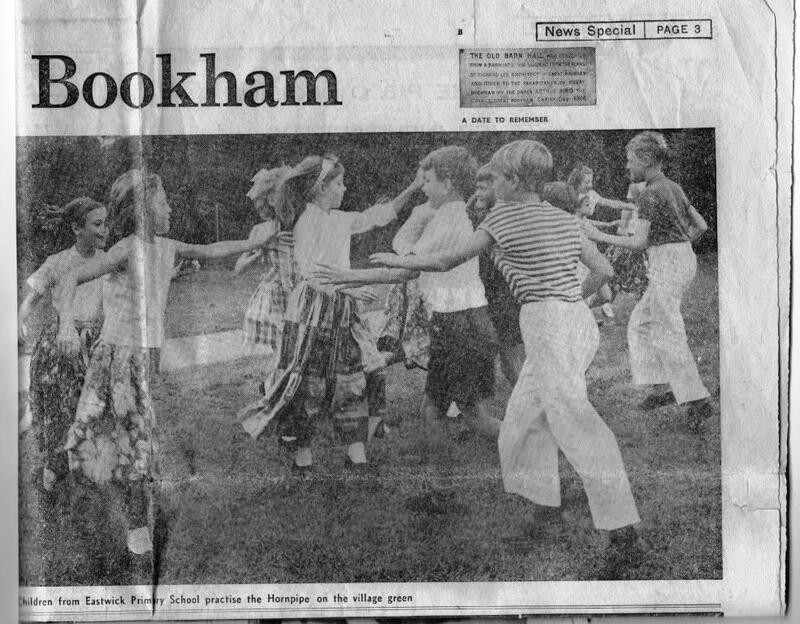 Nick Manley on Prices School Fareham ‘Folk’ Concerts – 1969-75. Kevan Bundell on Royton, Lancs, 1950s. Alan Gardner on Royton, Lancs, 1950s. Kevan Bundell on Alan Glynne-Howell – an appreciation.